Feminism on forced march in China? 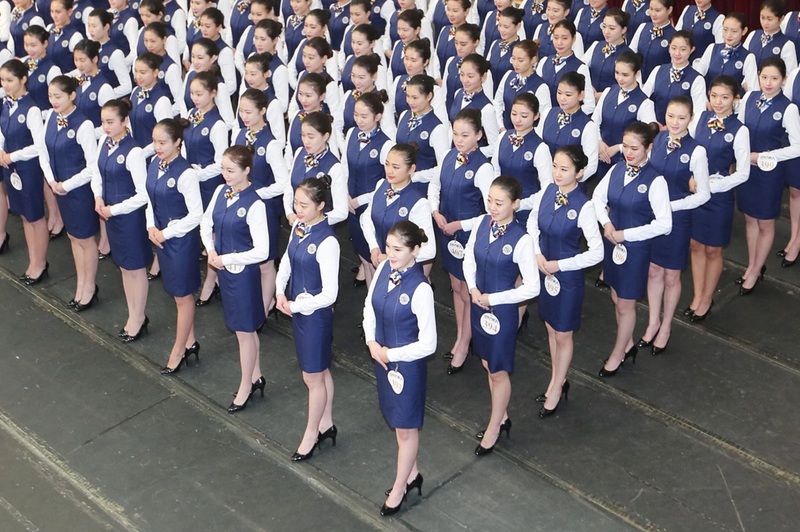 So glad to see feminism making such headway in China with the audition of these prospective flight attendants: conformity, uniformity, & preoccupation with youth. This must be where you graduate to from sweatshops. If they don’t make the cut with the airlines, they can join the army. What part of China’s mixed economy is this? Communism or capitalism? Or a regrettable hybrid of the both? Thank heavens for China’s working people rising up more often in rebellion. It will be thunderous & glorious when they once again throw off the shackles of tyranny. Hong Kong activists are leading the way but they are not alone & they are up against a mighty, well-armed force. This isn’t said boastfully when US working people are still sitting on their leaden asses. Rebellion has a conservative inertial dynamic since it’s only safe in numbers & with a clear perspective. But when it comes, it comes like a force of nature & has the capacity to change the world to make it suitable for human beings to live & love in. Now a vision, this can be a reality. Previous PostArshia Malik: another Muslim feminist shilling for IslamophobiaNext PostShooting of Tamir Rice: unfortunate mistake or part of war on Black youth?